You can feed giraffes at Naples Zoo. Lions and tigers and bears – oh my – just around the corner from Fort Myers Beach at the Naples Zoo. The only zoo between Tampa and Miami, Naples Zoo was created more than 60 years ago in a botanical garden established almost 100 years ago. It’s a lush setting where you can get up close to animals. Botanist and early conservationist Dr. Henry Nehrling acquired the Naples site in 1919. He created one of the earliest plant collections in Florida, containing about 3,000 species of tropical plants, many of which still remain. There really are South African lions, Mayalan tigers and black bears at Naples Zoo. You’ll also see many other mammals, including leopards, cheetahs, Florida panthers, giant anteaters, zebras and hyenas. Have you heard of or seen a fosa or a honey badger? You’ll find them here. There are also alligators, tortoises, cranes and macaws. 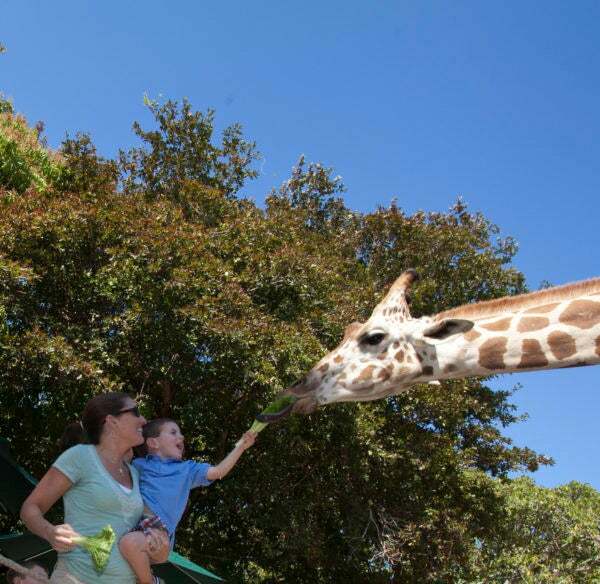 Stop by the giraffe exhibit, where you can feed the herd! 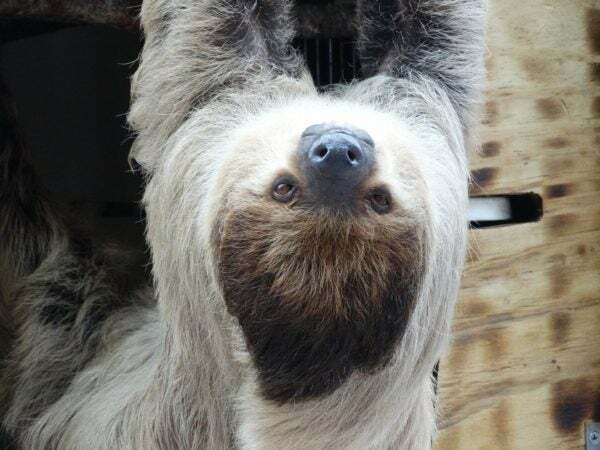 Susie the sloth is just hanging out. The Primate Expedition Cruise is a gentle ride on a pontoon boat around small islands within the zoo that house spider monkeys, lemurs, gibbons, tamarins and siamangs. Watch them jump and swing along ropes set up on their island homes. Check the Daily Schedule for this unique experience, which is free with zoo admission. Several times a day, zoo staff make presentations featuring live animals. Sit comfortably on shaded benches and learn about these animal ambassadors that aren’t on exhibit. In addition to the shows, there is also a daily Reptile Rendezvous in this presentation area. 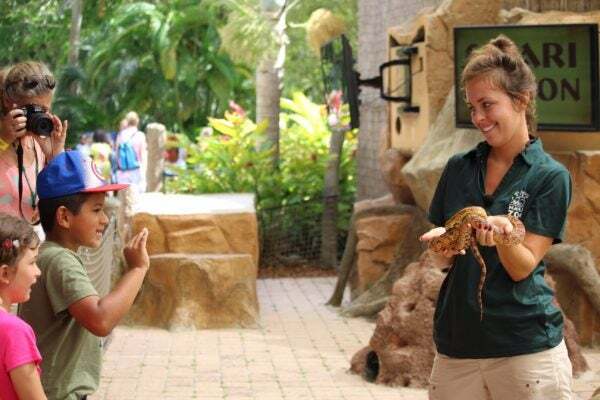 Around the zoo, keepers give animals talks at exhibits and conduct alligator feedings. All programs are free with zoo admission. Check the Daily Schedule for these activities. 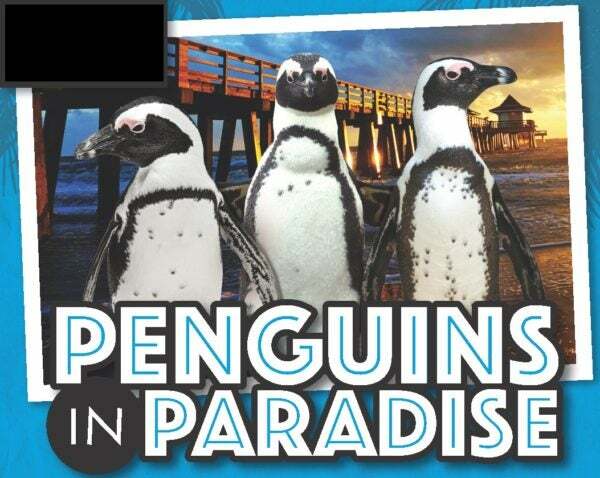 Four African penguins are spending the winter in Florida! The zoo is hosting a traveling exhibit from Nov. 15, 2017 through April 15, 2018. It is the first time penguins have been on exhibit at Naples Zoo. The special exhibit features naturalistic rock work, ledges and irregular surfaces, and a pool for swimming. See animals up close during Safari Canyon presentations. Naples Zoo is open daily from 9:00 a.m. to 5:00 p.m. Admission is $22.95 for adults (13-64), $21.95 for seniors (65 and up), $14.95 for children ages 3-12, and free for children 2 and younger. If you belong to another zoo or aquarium, receive $4 off adult admission and $2 of children’s admission with this coupon. All others can save $1 on adult tickets and $2 on children’s tickets by purchasing them online. 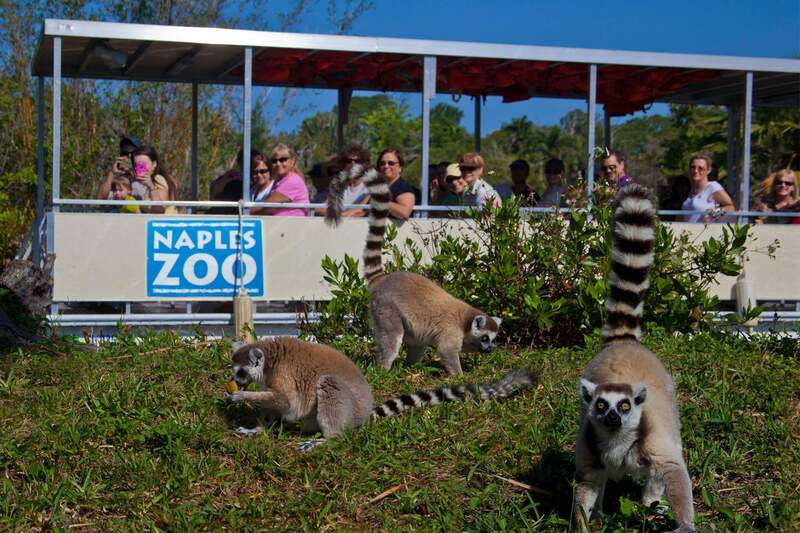 Naples Zoo at Caribbean Gardens is located at 1590 Goodlette-Frank Road in Naples. For more information, visit the zoo website or call 239-262-5409. Bring your family to a Sun Palace Vacation Homes property on Fort Myers Beach to be near the Naples Zoo for a fun day trip.